I’ve struggled a bit about whether or not to post about our Montessori-inspired parenting style and things we’re doing with LG. Ultimately, I’ve decided to go ahead and add some posts about LG, our Montessori-inspired parenting style, and a bit about why we’ve made the choices we have. I am very thankful for the ‘big’ Montessori parenting blogs out there and all their helpful resources and guidance, so I hope that one day my posts may help someone else out, in turn. Additionally, I think these posts will help my baby-oriented tutorials make a little more sense by giving them a framework. Today I’m starting with a post on why we love natural materials and simple toys for LG, which is something I know plenty of parents, not just those interested in Maria Montessori’s philosophy, care about. ne of the big things for us is using natural materials for toys (technically called “materials” in Montessori lingo) and making sure they provide meaningful development instead of entertainment. 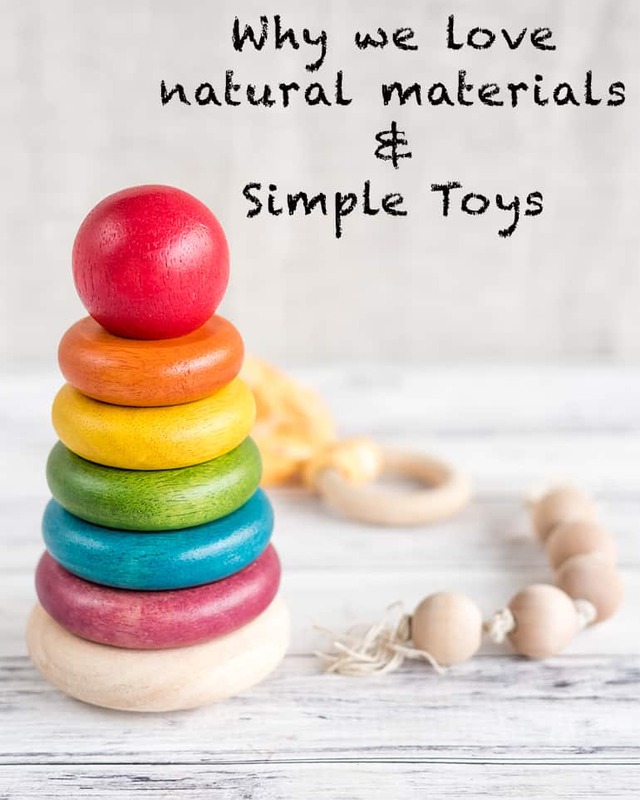 I’ve previously mentioned our penchant for natural materials in this wood bead clutching toy tutorial, but I didn’t discuss the importance (to us) of carefully selecting toys for their function, not just their composition. Maria Montessori descried what children do as “work,” not “play,” because the early years are so important. Experiences gained in early life provide the groundwork for everything that’s to come, which means Montessori believed all materials should fulfill a meaningful purpose, not simply “entertain.” She divided learning into different categories (things like mathematics, language, practical life, and sensorial) and believed each material should provide education in at least one of these categories. Although we haven’t found ourselves staring at a potential acquisition and asking “but what category does this fit in?? ?,” we definitely have asked what the purpose behind something really was and what it might teach before making a purchase or handing a toy over to LG. For us, this type of toy selection means means no flashing lights, mysterious noises, branded characters, logos, etc. on toys. Any noises a toy makes should make sense – a bell that jingles when it’s hit or a crinkly item that, well, crinkles when manipulated instead of something that makes, for instance, a mooing noise when a specific button is pressed. 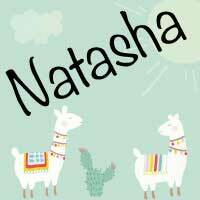 With a few exceptions, we seek to provide natural material toys made from materials that are inherently safe. Even though LG is still very young, we try to keep her toy options at any given time relatively limited. We believe that too many options at one time can quickly become cluttered and overwhelming, so we practice toy and book rotation. Only some of her books and toys are on her shelf at any given time – we keep the rest stashed away in our spare room and swap things out every week or so. Admittedly, we struggle a bit with this and by the end of the day there are usually more toys than I’d like on the floor, but we try! 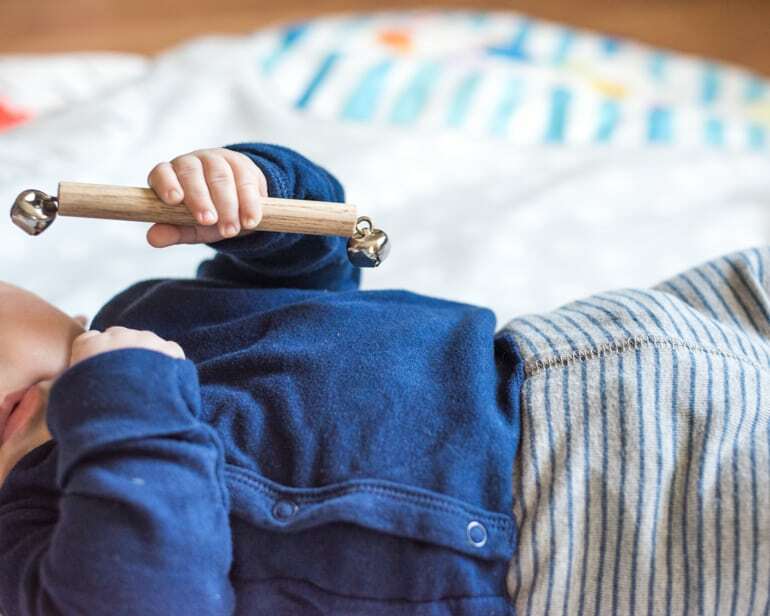 Choosing simple, natural material toys does not mean “boring,” even when selecting materials for an infant. On the contrary, we find natural materials to be much more intrinsically beautiful (plus they look great with LG’s handmade wood furniture!). We try hard to provide toys that are interesting and engaging – they just need to be toys that LG (or an adult playing with her) has to manipulate, not toys that ‘play with themselves.’ Her two current favorite toys are a wood clapper/bell toy that came with her Lovevery play gym (an absolutely fantastic product, by the way) and…a flannel wipe. She can hit the wood toy with her hands, reach for it, and bring it to her mouth, or she can be positioned to kick it with her feet. The flannel wipe, well, I guess it feels good on her gums and it’s certainly incapable of playing with itself! She actually likes pretty much any flannel wipe or burp cloth she’s handed, she doesn’t have just one favorite piece of flannel. It’s pretty handy because it helps her clean up her own drool! We do also have a few non-natural material toys. I’ve seen Montessori enthusiasts advocate for the natural rubber Sophie the Giraffe products, but we haven’t purchased any yet. We have several silicone items, like the silicone teething necklaces shown in this tutorial. 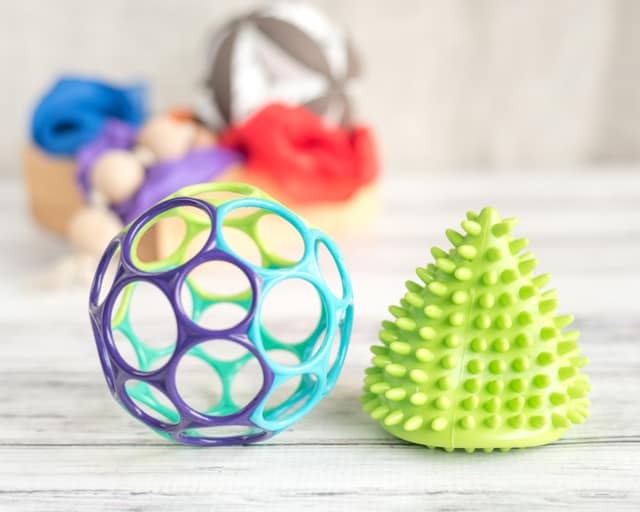 Although I wanted to get the wood Skwish toy, I ultimately decided on the Oball classic ball because I plan to use it for other activities in the future (plus I’m hoping my sister’s Skwish is either still doing okay ins storage at my mom’s house where I plan to look for it in a few more weeks). We have a Montessori-Style puzzle ball, but it’s still a little too challenging for LG’s tiny hands, so the Oball is perfect. We also have a couple of hand me down nubbly things, as I like to call them, that provide a great sensory experience. If you’re interested in bringing more Montessori into your home, I highly recommend you read the book Montessori from the Start. There are also too many helpful Montessori blogs to list, but How we Montessori, The Kavanaugh Report, Living Montessori Now, and Welcome to Mommyhood are four of my favorite. 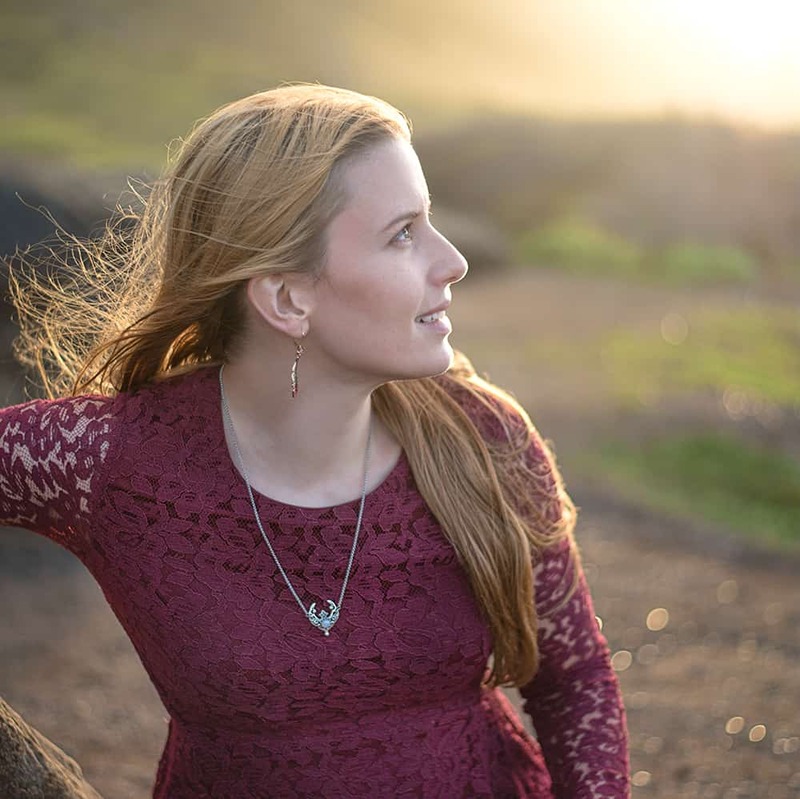 Montessori’s philosophy of education deals with children of all ages up into the teenage years, so you certainly don’t need an infant at home to incorporate Montessori ideas! We are very excited to continue our Montessori-inspired parenting journey as LG grows. Although I’m sure sometimes it will be a lot of work to provide appropriate work materials and demonstrate their use, we know we’ll be rewarded with a confident, capable little girl who’ll make it all worthwhile. 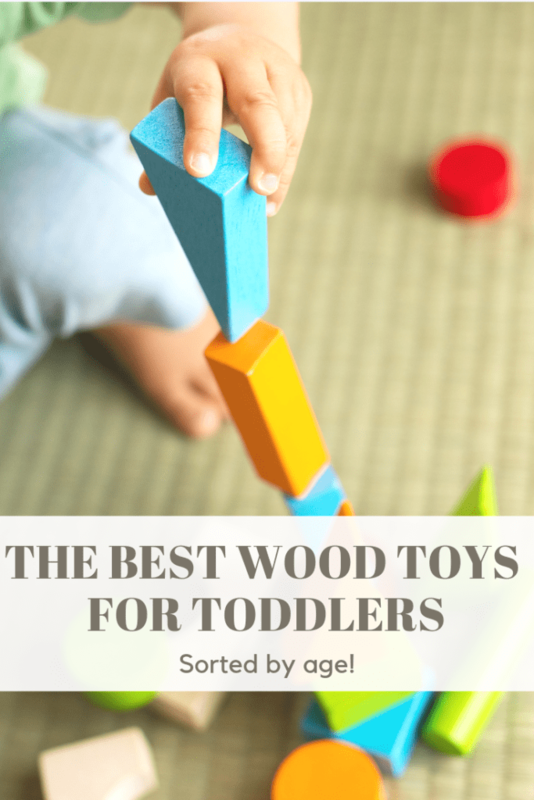 If you’d like to introduce more natural material toys to your little one, you’ll enjoy this post on the best wood toys for toddlers! Are you familiar with Maria Montessori? Do you prefer natural material toys? Why or why not? Actually, our baby likes paper bags, too! She loves kicking them and experiencing the sound/texture. Next post: Easy Galaxy Painting Tutorial with Craft Paints – Two Ways!